Andy Summers, guitarist for the world renowned rock band The Police, is also an accomplished photographer. 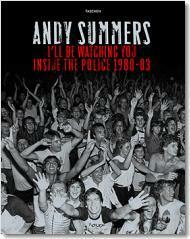 Andy Summers recently published a book of his photographs of the Police during their world travels in the early 1980s. The book, I'll Be Watching You: Inside the Police 1980-83, includes photos of the band members rehearsing and partying, as well as fans, landscapes, and still lifes. Summers has two special events scheduled for January. On January 8, 2008 he will make his only Los Angeles public appearance to sign copies of his book at Amoeba Music. Amoeba Music is located at 6400 Sunset Boulevard in Hollywood, California. For information call: 323-245-6400. The event begins at 6 pm. and is free and open to the public. On January 17, 2008 an exhibition of Andy Summers photographs will open at The Blender Gallery in Sydney, Australia. There will be an invitation only VIP launch with Andy on Wednesday, January 23 between 6pm-9pm. The exhibition continues through February 19, 2008. Blender Gallery is located at 16 Elizabeth Street, Paddington, Sydney. For information call: +61 2 9380 7080. See the Pop Life Art celebrity artists list for links to the artwork of more than 100 actors, singers, and musicians.